In the 1966 film Fantastic Voyage, Czech scientist and defector Jan Benes discovers a way to miniaturize matter, enabling his colleagues to navigate a pint-size submarine through his blood vessels and into his own brain to destroy a lethal blood clot. Today, this sci-fi gem is edging closer to reality. With the help of microfabrication, researchers are beginning to learn how to deploy tiny, cellular-scale machines into biological systems. Micromotors of all shapes and sizes are being developed to sense environmental toxins in air or water, deliver drugs to target tissues, and perform surgical procedures at the single-cell level. 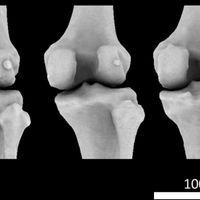 What complicates their use in living organisms or cell-culture systems, however, is that their tiny size leaves them struggling against fluid forces. While a large ship at sea can weather the waves, a smaller rowboat might struggle to stay on course. As micromotors grow smaller, blood or viscous cell-culture fluids make it difficult for the motors to control their movements. To counter the viscosity, many efforts begin with propulsion systems that prove toxic to living cells. Maneuvering a microstructure in liquid is not simple, and being able to drill [into a single cell] is another step forward—Sarvesh Srivastava, Institute for Integrative Nanosciences, IFW Dresden . Here, The Scientist explores four strategies for making micromotors biocompatible and getting them in shape for real-life voyages. PROBLEM: Micromotors need some sort of propellant; one example utilizes the enzyme catalase, which acts on hydrogen peroxide, to generate fast-flowing bubbles of oxygen that push the capsules forward. But catalase, and most other currently used forms of propulsion, are not safe for living cells. Sánchez and his colleagues wanted to devise a nontoxic propulsion system that could ultimately be used safely in vivo. SOLUTION: The researchers set out to fuel the tiny machines with common metabolites such as glucose and urea. They synthesized the machine bodies—hollow silica balls 2.3 μm in diameter—and immobilized them in a monolayer on a solid surface to deposit iron onto one-half of their outer surfaces. Then they coated the other half of the balls with urease, an enzyme that decomposes urea present in blood or cell-culture liquids to produce carbon dioxide. The iron in the metal layer enabled the team to use magnets to steer these two-faced shells, commonly known as Janus microparticles. The enzyme-coated half powered chemo-osmotic propulsion by producing carbon dioxide and ammonia from urea. 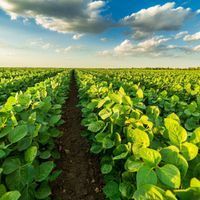 Adding urease activators or inhibitors turned the microparticles on or off, and could also control the rate of the enzymatic reaction to regulate the particles’ speed. Human blood typically contains a 2 mM to 7 mM concentration of urea. 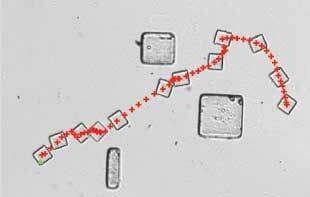 These microparticles move at an average velocity of 3 microns/sec at urea concentrations as low as 0.5 mM, making them likely to remain active in the bloodstream (ACS Nano, doi:10.1021/acsnano.5b08067, 2016). Since the shells have been shown to work with urea as a fuel source, scientists can now explore other options, says Sánchez. He aims to create a library of enzymes that work on different metabolites under physiological conditions, so researchers can pick particles based on the fuel sources available in different tissues or disease conditions. PROBLEM: Microscopic structures in plants, microbes, or animals often have properties such as low toxicity, adsorbent surface chemistry, or unique shapes that make them ideal materials for micromotors. But the precise three-dimensional nature of these structures, as well as their functions, have not yet been recreated in the lab. 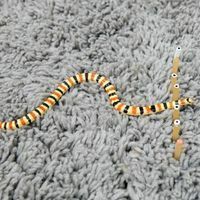 Rather than trying to imitate nature, Srivastava and his colleagues in Oliver Schmidt’s lab wanted to use plant-derived materials to create maneuverable micromachines. SOLUTION: The group extracted polygonal, needlelike crystals of calcium oxalate known as raphides from the leaves of Dracaena marginata, a common houseplant. These crystals, used primarily as a defense mechanism against herbivores, are abundant in many plants, where they reside within specialized plant cells known as idioblasts. The researchers coated the 40–60-μm-long Dracaena raphides with an iron-titanium mix to make them magnetic, and then incubated the crystals with the anticancer drug camptothecin for three days. The needles’ chalky material absorbed drug molecules through the iron-titanium, while their “broadsword-like” edges were able to penetrate cells. When incubated with HeLa cells under a rotating external magnetic field, the microneedles drilled through cells’ plasma membranes and killed cells in culture. When drug-infused raphides were incubated with cells without the drilling action, the particles also released camptothecin to reduce proliferation and kill cancer cells (Adv Mater, 28:832-37, 2016). But the drilling action helps speed drug delivery, and the magnetic field can also help position the micromachines to regions where drugs can be more precisely diffused into tissues. “Maneuvering a microstructure in liquid is not simple, and being able to drill [into a single cell] is another step forward,” Srivastava says. The plant-derived microneedles have not been tested in animal models, but appear to be nontoxic in cell cultures. The coated raphides moved through cell culture media without the need for a surfactant to reduce surface tension. Such structures have never been successfully synthesized in vitro, but they can be extracted from biological material in large amounts quickly and easily. A key step is removing the sticky gel-like matrix that surrounds the raphides inside plant cells. The enzyme cocktail used to do so must be customized to different plant species or sources of material, Srivastava says. For their study, the authors used a combination of commercial plant protoplast digest solutions and lab-made mixes. PROBLEM: In theory, siRNA targeted to selective stretches of mRNA can therapeutically repress protein levels. But siRNA knockdown is often inefficient and nonspecific, in part because of the lack of appropriate delivery systems to administer the molecules. “Right now the challenge is still how to get siRNA safely and effectively into targeted cells,” Chen says. SOLUTION: Most methods rely on cell membrane fusion or receptor-mediated uptake to transport siRNA into a cell, but Chen and his colleagues turned to nanomotors instead. 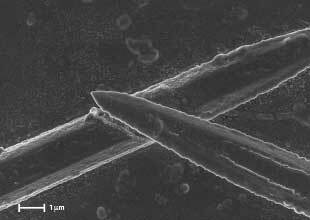 They engineered a gold nanowire-based structure that pierces and enters the cell. In previous studies, his colleagues and others propelled similar nanowires inside cells to deliver plasmid DNA or to monitor the expression of microRNA (ACS Nano, 9:6756-64, 2015). To turn the nanowires into siRNA delivery machines, Chen’s group began by coiling a repetitive DNA template around 4-μm-long gold wires. This DNA strand was complementary to the DNA overhang on the siRNA it would be carrying, and because each overhang is just 20–22 nucleotides long, the DNA strand could anchor several copies of siRNA onto a single wire to increase the efficiency of uptake. 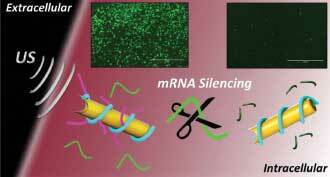 These DNA-RNA coated nanowires, the researchers found, were 21 times more efficient than a solution of the same DNA-siRNA loops at knocking down green fluorescent protein expressed in mammalian cell lines in vitro. Using ultrasound to propel the nanowires made them even more effective: with a 2.66 MHz frequency applied for five minutes, the structures penetrated cells with an efficiency of 74 percent, compared with 20 percent when the nanowires were static. Most cells remained alive after the treatment. Ultrasound helped control the power and direction of nanomotor movement, Chen says. The viscous forces that impede the movement of synthetic micromotors are the same ones that motile bacteria rely on to propel themselves forward. Now, the team is working to further boost the nanowires’ efficiency, testing how tweaks to their size and shape or the length of DNA coiled around them affect their performance. Results so far suggest that the nanowires work best when the DNA strand anchoring siRNAs is somewhat shorter than the ends of the nanowire itself, to ensure the entire payload is delivered to cells. PROBLEM: The viscous forces that impede the movement of synthetic micromotors are the same ones that motile bacteria rely on to propel themselves forward. Kim’s previous work showed that it was possible to harness bacterial motility to power synthetic microbots, but he also had to devise a way to prevent the bacteria from bumping into obstacles as they swam through fluids so that they could more effectively drive the device. Solution: Kim and his colleagues coated microchips with Serratia marcescens, a species that uses whip-like flagella to move. 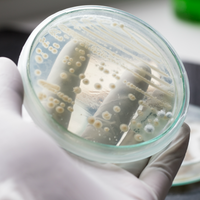 Bacteria carry a negative charge on their surface, so the team could alter the microbes’ direction or speed of movement by manipulating electric fields. But the system is also very susceptible to interference caused by nearby nonspecific external electric fields or insulators, so the researchers devised an algorithm that accounts for such distortions and allows the bacteria-powered microrobots to navigate a miniature obstacle course without crashing (IEEE Trans Robot, doi:10.1109/TRO.2015.2504370, 2016). The robots are scalable and can be adapted to use many different kinds of bacteria, such as E. coli or Salmonella species, Kim says. The species selected depends on the purpose of the microrobot, its size, and the properties of the fluid environment. Using magnetic particles instead of microchips would offer another way to control the robots. Because the bacterial coating is likely to trigger immune reactions, these devices probably won’t be used in vivo. But in vitro, their advantage over other forms of micromotor propulsion lies in the microbes’ ability to act as sensors. Some bacterial species swarm toward light or specific chemicals, so they can be used to sense different phenotypes or cell types within lab-on-a-chip devices. “We can directly use these bacteria-powered microrobots for sensing cancer or other diseases,” Kim says. Such bacteria-driven machines have potential uses in many tasks that involve delivering targets from one point to another on the microscale, from maneuvering cells into specific positions within microfluidic devices to assembling and disassembling microscale machinery.